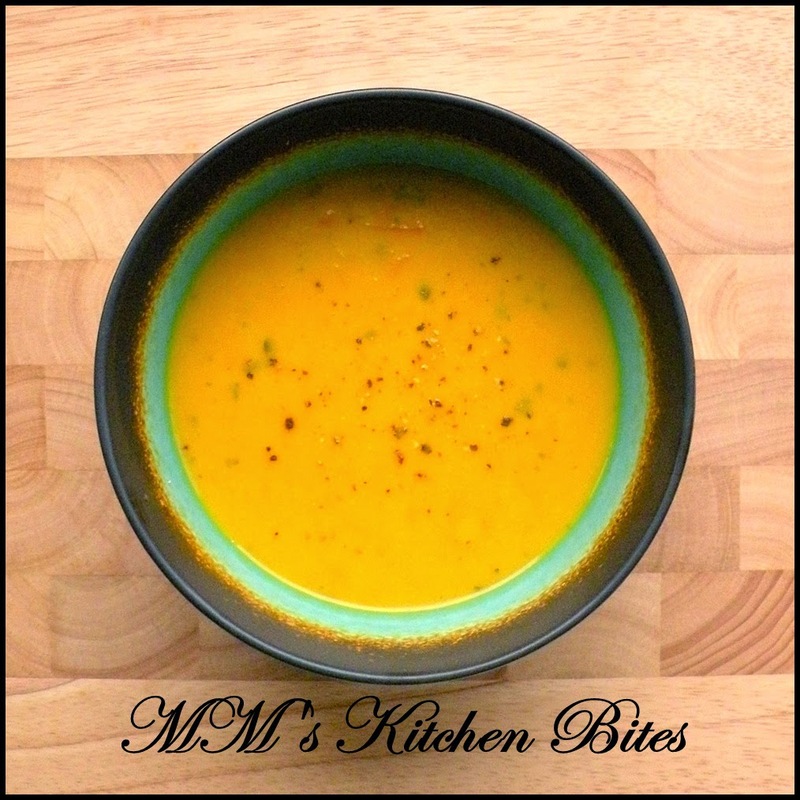 MM's Kitchen Bites: Carrot and Coriander Soup...staying out of trouble!! Carrot and Coriander Soup...staying out of trouble!! Heat the oil in a large saucepan or Dutch oven. Over medium high heat, stir in the onions, celery and potatoes. Once the onions start to soften, add in the garlic. Sauté for about a minute. Add in the carrots, coriander powder, turmeric, nutmeg, pepper and the stock. Increase the heat to high and once the stock comes to a boil, reduce the heat to medium low and leave to simmer for about half an hour till the carrots turn soft and tender. Cool slightly and then blend the soup either using an immersion blender or a food processor. Taste and adjust for seasoning. Look at the consistency – if the soup is thicker than you want, transfer back to the pan and add more stock or water. Using the large side of a box grater, grate the carrot you had kept aside earlier. This is totally optional, but adds a nice texture. Add the grated carrot and chopped fresh coriander to the soup. Heat the soup again till piping hot. Switch off the heat and mix in lemon/orange juice. Stir in the cream if using and done done done!! Skip the garlic and use ginger instead. Add 1 tsp finely minced ginger paste along with the carrots. Reduce the coriander powder to 1 tsp and add 1 tsp cumin powder as well. If using nutmeg, you can either add as mentioned above or add just before serving. Depending on the sweetness of the carrots, you can add some honey if you want after blending the soup. Honey goes especially well with this one, if you are using ginger.